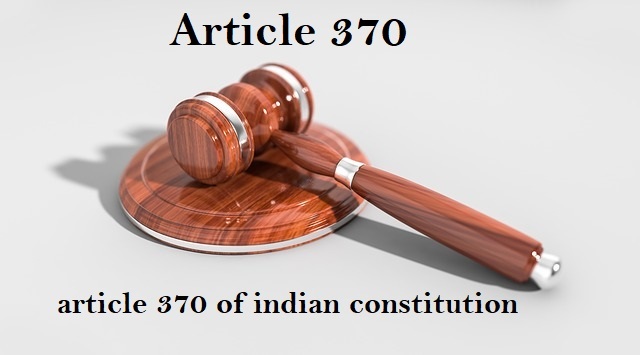 Article-370 :- At present, there are 29 states in present-day India, although all the states run in accordance with the Indian Constitution and the law system but there are many such laws which do not apply in Jammu and Kashmir. Because Jammu Kashmir has a special status status. And due to this, Jammu Kashmir is not being part of India even being a part of India. In fact, Jammu and Kashmir is given special status under Article 370-Article 370. The days in which politics is going to get some controversy. Recently Mohan Bhagwat also mentioned 370 articles. In today's situation, the condition of Jammu and Kashmir is very bad. Here children are born in the shadow of terrorism. Many youths of Kashmir are forced to flee to the swamp of intestine by force or by their mind wash. This can also be done because the hold of Indian law is weak here, the central government can not take action directly on this point. But why Jammu is given the right to a special state under Dhara 370-Article 370? We will know this through this article. Indeed, at the time of Independence, there were 562 princely states in India which merged with all the princely states. But there was a debate over Kashmir, but considering Pakistan's view on Kashmir, the then King Hari Singh of Jammu and Kashmir offered to the Indian government the merger of Kashmir with the Union of India. But when the process of incorporating Kashmir into the Indian Union began, the opponents of Pakistan supported it started invading Kashmir. Although Jammu Kashmir was merged in India, considering the situation, Jammu Kashmir was given special rights under section 306. Later, Section 306 was changed to 370. Article 370 gives Jammu and Kashmir a special state, under which Jammu Kashmir has many special rights. Let's tell you what rights they have. Due to being a special state of Jammu and Kashmir, Section 356 can not be imposed here, i.e. that the President has no right to sack the state constitution. Urban Land Law is not applicable in Jammu and Kashmir. At the same time, the state can not buy any external land. Section 360 of the Constitution, the financial emergency also does not apply here ie that there can not be a financial emergency even after a financial emergency occurs across the country. In Jammu and Kashmir there is a need for assembly approval to implement any rule of law or scheme. The term of Jammu and Kashmir assembly is 6 years, while in the rest of India, the term of the Assembly is 5 years. At the same time, when the government falls down prematurely, there is a governor's rule, while the rest of the states seem to have President's rule. Article-370 :- Jammu Kashmir has its own flag, as well as there is nothing against the country's opposition to say anti-nationalism or law is not a crime. People of Pakistan also get citizenship in Jammu and Kashmir. Here women, if they marry a state boy on one side of India, their citizenship ends, even if they marry a Pakistani, then this citizenship remains. Women are not even given reservation in Jammu and Kashmir. This is the reason why women are still struggling to move forward. Because of the 370, RTI can not be implemented in Jammu and Kashmir and there is no CAG here. If, in other words, Section 370, which has given Jammu and Kashmir the right to a special state at one time, has not been able to develop it today and there is an increased cause of terrorism. The government is also making efforts to eliminate it, but the separatist leaders of Jammu and Kashmir are not allowing the end to Article 370 for its own benefit. Because of this, the youth here are also 20 years behind the development status of the youth of other states of the country.